The meadow path makes the unique landscape of the polder grasslands in the Lower Oder Valley National Park’s floodplain south of Schwedt a true experience. Using the branched network of pathways, visitors to the Lower Oder Valley National Park can experience the protected area up close and personal. In addition to the various looping paths through the protected area, there are also several adventure trails in the floodplain and polder landscape. These trails include the floodplain path, which is 3.7 kilometres long and leads from the Criewen Bridge through Polder-A to the Saathen Dam. Interesting points are marked with “Floodplain Path Stakes”, the visitor will find further information in a small brochure. The brochure is available at the Criewener Nationalparkhaus or can be taken at any time from a wooden box at the Criewen canal bridge. It’s worth visiting the Saathen Dam, one of the largest inlet constructions on the Oder, and stay a bit longer to absorb the extraordinary atmosphere of the Oder valley. Here the Oder valley is bordered on its eastern bank by a mighty range of hills, in warm summer weather you can hear the rustling of reeds and willow leaves, the songs of the reed bunting and reed warbler. In the winter, visitors can hear the muffled cracking and grinding of the drifting ice as they watch water birds resting on the passing ice floes. It can also be very noisy at the Saathen Dam: in autumn it is opened so that the river can spread out when the water level is high. With a thunderous sound the water masses then surge into the Oder floodplain. The river floodplain is dominated by willows, which sometimes form small softwood forests. With their narrow leaves and flexible branches, willows offer little resistance to the water streaming past. Moreover, due to their rapid growth, they are extremely regenerative. In the more elevated areas of the floodplain, ash and oak trees grow with their deep roots anchored in the moist soil. They form the remains of the hardwood riverside forest, which covered the upper areas of the Oder valley in former times. The floodplain pathway leads past oxbow lakes of the Oder and allows you to see the old course of the Oder, which in 1862 for the last time passed right by Criewen in a broad meander. Afterwards, it was straightened and flows far away from Criewen on the east edge of the Oder valley. Parts of the backwater on the west edge merged with the Hohensaaten-Friedrichsthaler Waterway, which was created as an artificial waterway parallel to the Oder at the beginning of the 20th century. 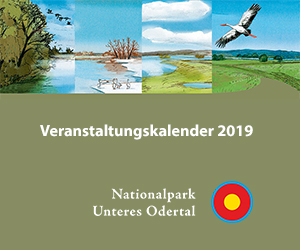 Thus, the meadow pathway not only makes the flora and fauna of the Lower Oder Valley National Park tangible, but also provides information about the changes in the natural landscape humans made here.